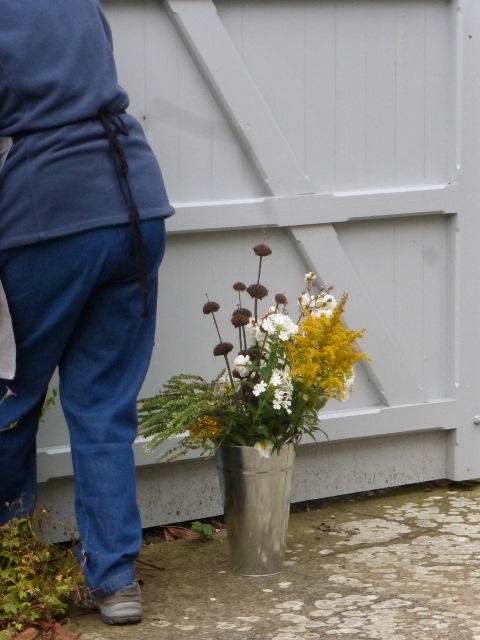 I must admit that I was slightly concerned when the Events team at Belmont House got in touch to confirm the final details for their Blooms at Belmont workshop – the plan was to hold the event outside, in the walled garden. After the weather we’ve been having over the last week or so I thought that was a bit of risk. Although there was a back-up plan – the Orangery – we didn’t need it. The weather was perfect! There’s lots that goes on behind the scenes to make each workshop a success. From the planning that started at the beginning of the year, making sure that this event would be a good fit for the programme of activities that the team at Belmont co-ordinate throughout the year – through to marketing, taking bookings, setting up the marquee, and planning the catering. I met with Graeme – the Head Gardener – a few weeks before the workshop to familiarise myself with what plant material would be available for cutting on the day. From there, conversations were had with the Events team to buy in the necessary additional bits and pieces. On my part there was also some prepping needed. This started with sketches of the arrangement that we could be making. The key here is making sure that here is something for everyone – from the flower arranging newbie through to those with more experience, looking for new ideas to inspire. The weekend before the workshop I started work on the sample twiggy structures I’d planned to add a bit of a twist to the day. One was a bound vertical mat, which was designed to curve around the pot edges and the other a hovering checkerboard lattice. My next job and the one I dislike the most is packing my boxes. It’s not difficult, I’m just a bit disorganised as I move from workshop to workshop. If only I could be more disciplined and put my collection of scissors, secateurs and aprons back in their proper places, I wouldn’t have to hunt for them in last week’s discarded box! After the school run I have enough time to take a leisurely drive to Belmont, which is only five miles or so outside Faversham. It’s a lovely drive through the Kent countryside, with glimpses of Belmont House off to the right across its landscaped parkland. As I pull up Graeme is making the watering can run from the outside tap in the courtyard to fill up a huge bucket where we’re going to soak our flower foam in and dunk our buckets for conditioning our flowers. The marquee is up (no sides: that’s daring!) and there’s dew on the grass. I shuffle some of the tables around, to get the layout I want. Lay aprons on chairs and stack up all the other equipment we’ll need on my supplies table. Then, I’m let loose with my scissors. Oh the joy. 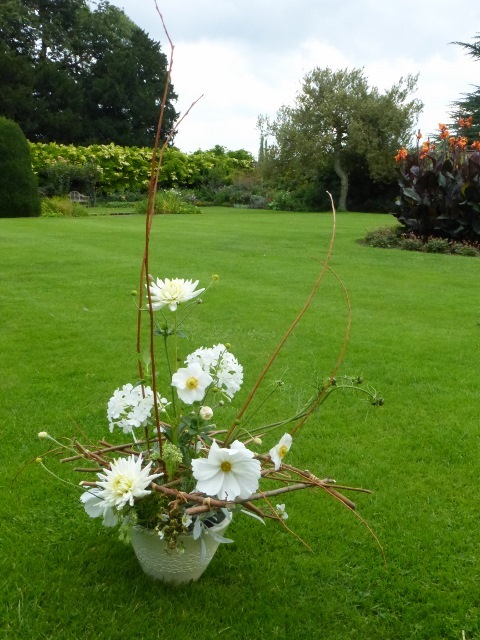 It feels a little bit naughty to be on my own, cutting from the gardens at a stately home. I have to remember to slow down – I’ve been invited to be here, so I don’t need to be surreptitious. A deep breath and I carry on. I’ve decide to sweep through the kitchen garden with a white theme in mind. 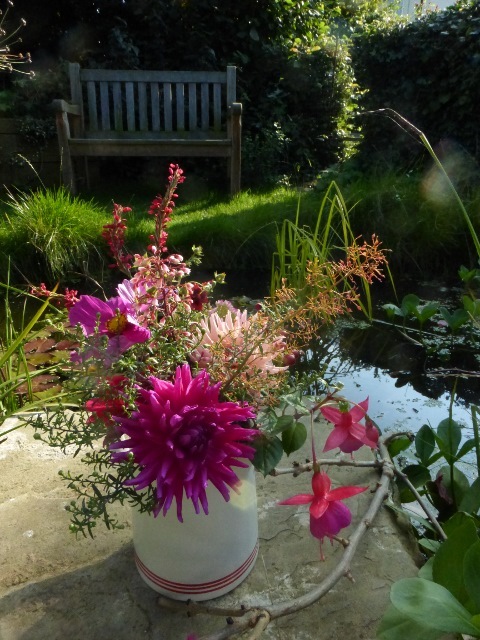 I pick dahlia, cosmos, Japanese anemone, and lots of pale sedum which hasn’t quite burst into flower. Back at workshop HQ I get to work on flowering up my two sample arrangements and with time to spare, put my senses to the test and pick a handful of vibrant hot pinks, oranges and reds from the walled garden. These flowers looked amazing casually arranged in a jug on my work bench. As our guests arrive we introduced ourselves and talk about what to look out for in the gardens for incorporating into the flower arrangement that we’d be creating that afternoon – in terms of colours, sizes and shapes of flowers. Next Graeme took us on a fabulous tour around the perimeter of the house and shared with us some of the history of Belmont (and its on-going restoration). We looped the house – up the hydrangea flanked drive, across the Orangery, back to the walled garden and over the lane to the kitchen garden and nuttery. It was lovely to see what everyone came back with. From clashing hot colours, to seaside shades of blue and white, autumn yellows and tiny tapestry-like materials. We got on with standing our flowers in water to drink, while we enjoyed the most delicious lunch. Every Wednesday during the season you can book a tour of the gardens with Graeme and the stable café is open – at other times there is a self-service facility. The café is lovely. It retains its original charm, with bench seating and canteen tables in each of the stalls. 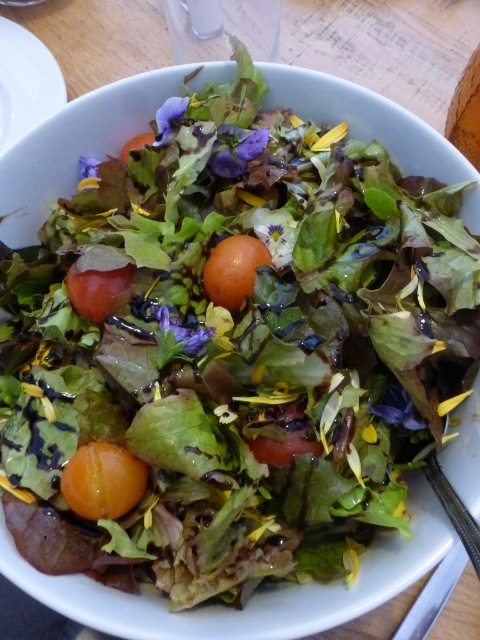 We ate the most delicious (home grown) potatoes, with a flat tart/quiche, scrummy coleslaw (and I don’t even like coleslaw) and a green salad dressed with fresh flower petals. Hilde was a fabulous host – I’ll be back soon to try her yummy cakes. 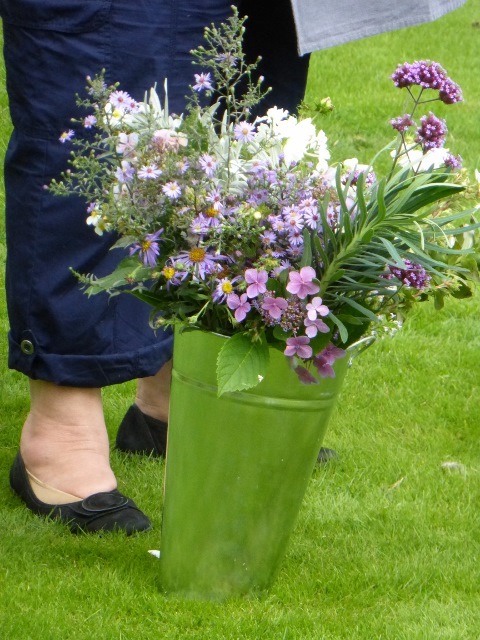 By the end of the afternoon everyone went home with a stunning flower arrangement and a happy smile – come and join us next time. It would be lovely to see you. Have you signed up to my newsletter? As a thank you I’ll enter you into a competition to win a flower arranging workshop (worth £350) – if you’d like to be in with a chance you’ll need toyou’re your name to my list by midnight Sunday 13 December 2015 (signing up is a two-step process, so don’t forget to complete the subscription process by clicking on the confirmation email you’ll receive). The winner will be picked at random and notified by email by Sunday 20 December 2015.